Journalists in Lagos today staged a demonstration to protest the recent attacks on members of the press in the state. A photojournalist with Leadership bvcdsazxxNewspapers was assaulted last week at the mortuary of the Lagos State University Teaching Hospital and just two days ago, two other photojournalists suffered similar fates in Ikeja. Members of the Lagos State chapter of the Nigeria Union of Journalists, NUJ today convened at the Ladi Lawal Press Centre, Ikeja where chairman of the Lagos State division of the body, Deji Elumoye condemned the attacks. 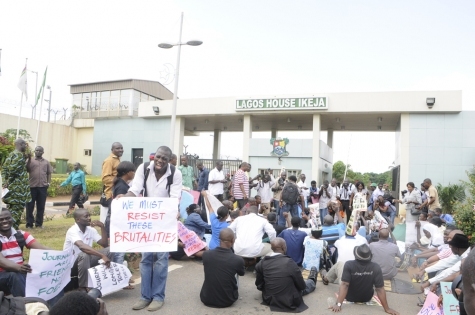 The demonstration then moved to the Lagos State Governor’s office. Secretary of the Lagos NUJ, Silver Emeka Okereke, also condemned the attacks and warned that journalists may be forced to take the law into their own hands. “The three others in the estate are constantly protected by the security agencies, but for us, we are left to our fate,” he said, referring to the fact that journalists are described as the Fourth Estate of the Realm. “This incessant harassment should stop forthwith because if it continues, we are going to take laws into our hands and I mean it,” he said.